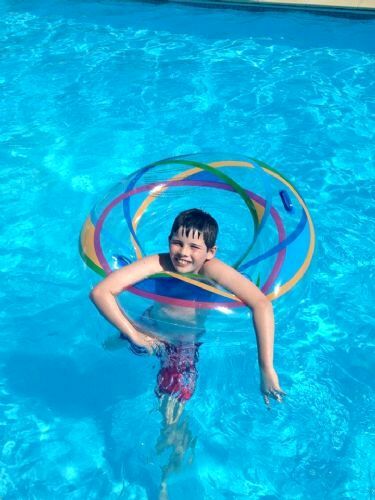 The happy kids equals happy parents formula has kept families coming back to Bel Air Gites for years, being a super safe haven for toddlers to teenagers to have fun and make friends while grown-ups can relax. 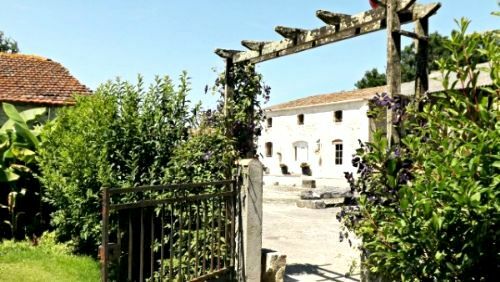 Irish couple, Paul and Patricia took over the reins in 2010 and their first season was enough to know there was no better way to live their dream in France than sharing it with others at this friendly little holiday homestead. 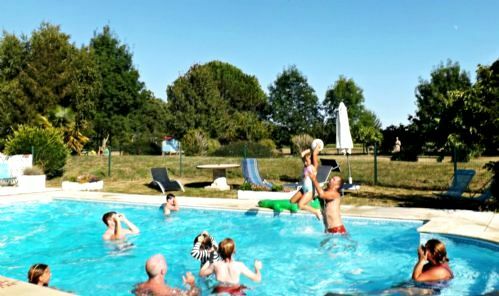 Bel Air Gites is a far cry from the all-singing-all-dancing holiday complexes but still offers key things that parents value the most – a safe environment for children to play the days away, with a great playground, a play-barn full of toys and a heated pool. 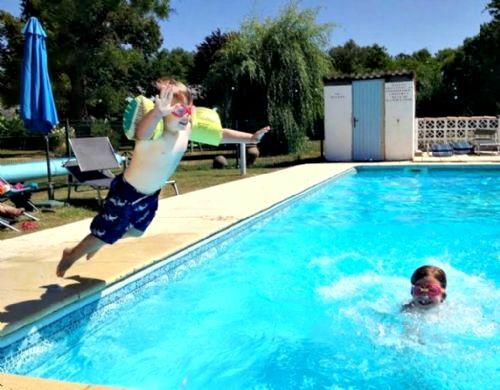 Parents can rest easy, in the Charente Maritime sunshine, in the knowledge that kids of all ages can free range into the big grassy garden, finding a playhouse, play fort and ride-ons in the playground, or clambering for a bounce on the trampoline or teaming up with new playmates for games of football, basketball, volleyball and boules. The big play-barn has all kinds of baby and toddler toys, plus a pool table, games and shelves full of DVD’s and then there’s the heated pool, which is fully fenced and gated, with a child safety lock and has wide Roman steps for little ones to splash in the shallows, plus an assortment of pool toys, floats and inflatables. 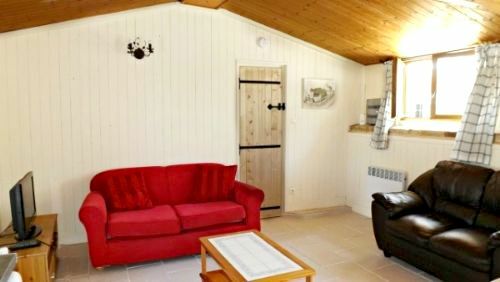 The traditional Charentaise farmhouse and all four gites are comfortable and well-equipped for families, from a kitchen with all the essentials and utensils, to TV with English Channels, DVD player and free Wi Fi. Parents with babies and toddlers can also travel light, whether flying or fly-driving, thanks to all the kit and caboodle available at Bel Air, including pushchairs, potties, bouncers and extra beach towels. 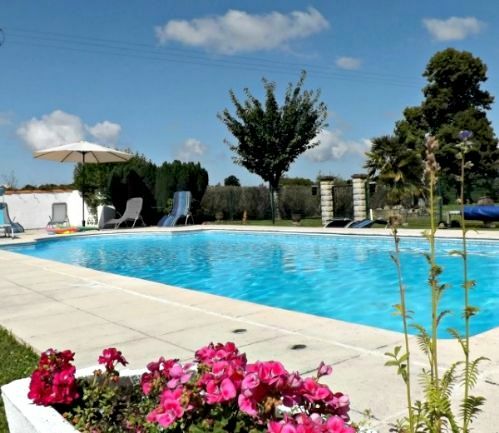 The farmhouse and gites also all have their own private patio area for breakfasts al fresco, stoking up a BBQ and simply sipping a local Cognac as the sunsets over the fields. Bel Ait Gites comprises one 3-bedroom farmhouse, three 2-bedroom gites and one 1-bedroom gite, sleeping 4 to 6 guests plus babies in cots. 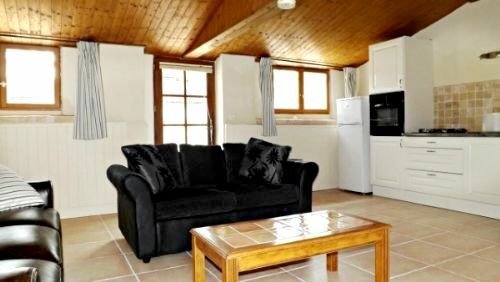 The whole lot can also be booked for a special group holiday of extended family and friends. 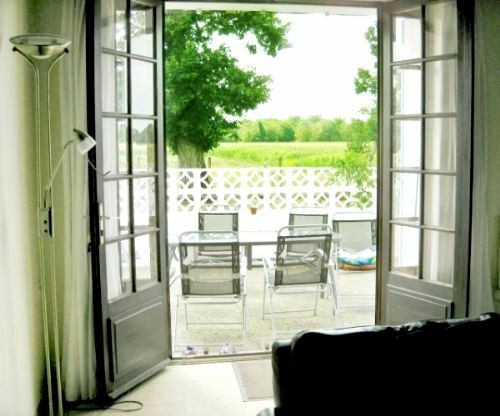 Le Chai (The Wine Store) is a 2-bedroom, single storey gite that is ideal for a family of 4 with babies and young children. 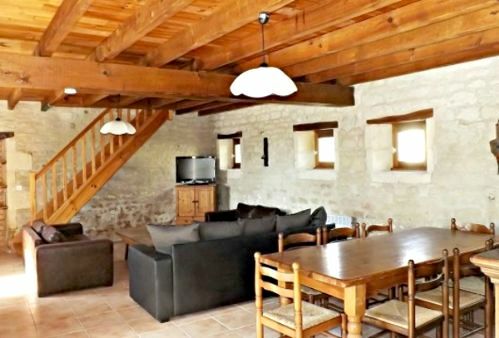 The gite has been recently refurbished but retains its character through beamed ceilings and rustic stone walls. The open plan layout is spacious and airy, but also nice and easy for parents to keep an eye on the children while cooking or lingering over coffee in the dining kitchen area. 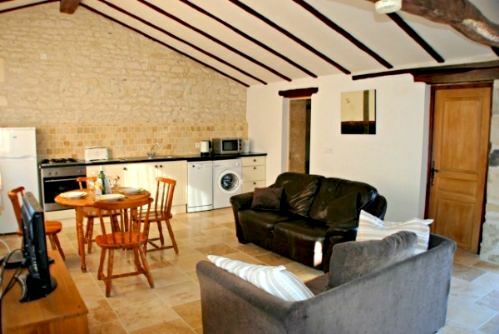 The living area has leather sofas, an LCD TV with UK Channels and DVD player and it opens onto a private patio area, with garden furniture, a barbecue and views of the fields and woods beyond. 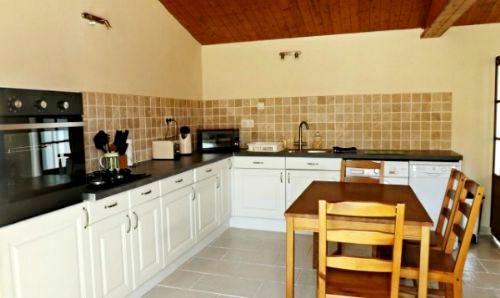 The dining kitchen area is equipped with a gas hob and electric oven, microwave, fridge, washing machine and all the essential utensils. 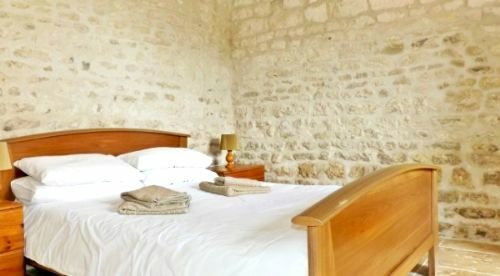 Le Chai has one double bedroom, with lovely exposed stone walls; a cheerful children’s room with twin beds; and a bathroom with a shower cubicle. 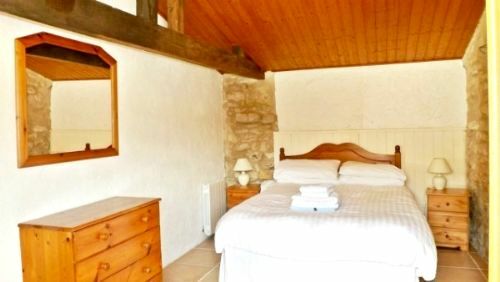 Sleeps 4 + infant in 1 x double bedrooms and 1 x twin room. La Rochelle or Bordeaux are 1 hr 10 drive away. 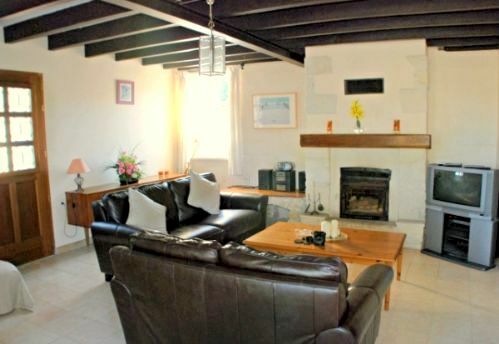 St Malo is the nearest and we can provide a discount code for Brittany ferries. 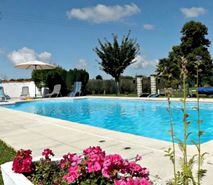 Shared pool which is heated, fenced and has roman style entry steps. Indoor play barn with toys and games. 4 x travel cots with mattresses, 3 x high chairs, 2 x booster seats, 2 x strollers, 2 x bouncers, 3 x baby baths, sterilising bags, potties, bed guards, stairtgates, socket covers, plastic crockery and plastic cutlery. This baby friendly cottage has a good stock of general toys. This babyfriendly cluster has a playbarn and Playground, swings , slide, playhouse, trampoline, basketball, boules, and volleyball. 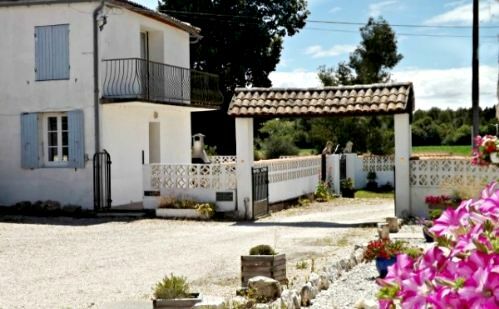 All gites have a private garden with BBQ and outside dining area. Royan 30 mins drive away.